Cutting edge length: 1.69 in. Blade height (at heel): 0.38 in. 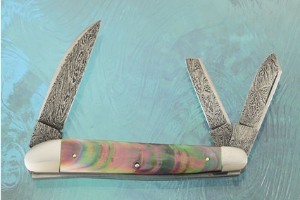 Description: Mastersmith Bill Burke makes knives that are as high performance as a knife can get. He is best known for his sheep horn hunting knives. Here, he has put his hands to a very rare and very elegant folder. Like his hunters, the blades were pre-tested for edge flex and cutting ability before assembly. The heat treatment and tempering follow the formulas developed in conjunction with Mastersmith Ed Fowler. This technique creates some of the sharpest and most long lasting edges found anywhere. The complex damascus blades were hand forged from 1084 and 15N20 carbon steels. This classic Three Blade Split Back Whittler features a 2 inch wharncliffe, a 1-1/2" spey blade and a 1-1/2 inch cutoff pen blade. 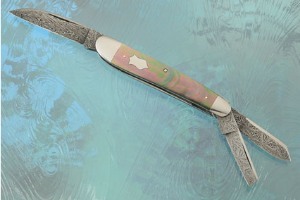 The wharncliffe is a very useful blade from the 19th century. It Is relatively thick at the spine for strength and tapers to a fine point and edge. 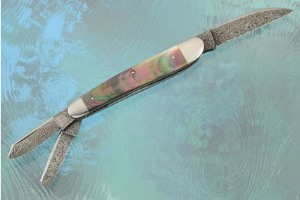 The spey blade is very useful for working with livestock and for carvers. 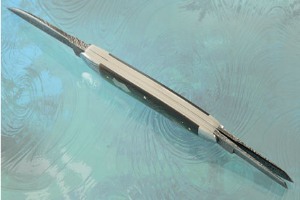 The cutoff pen blade was designed in the days of quill pens. Their purpose was to sharpen the points of the quills. The pen blade was the perfect blade for sharpening and splitting the point. It is a great shape for carving and whittling. 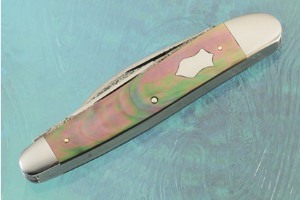 The scales are exhibition grade blacklip mother of pearl. The scales are perfectly fit to front and rear 416 stainless steel bolsters and are secured with stainless pins. The action is smooth with firm half stops.